Got a scarf? Plus two hoops? And one minute? Then you have what it takes to make this bag. And here’s the best bit. When you’re done for the day, you can change the scarf to make another bag with your same hoops. I saw something similar to this on Ari Seth Cohen’s blog – Advanced Style. He has a model – her name is – Tziporah Salamon. In a few shots of her, she has bags not unlike this one. I wish she would show how she makes them. I managed to come up with this version. A reasonable sized scarf – so not a neck scarf. Ideally the fabric shouldn’t be too thin – it’s going to hold all your possessions. But it also mustn’t be too thick or you won’t be able to tie the knots. 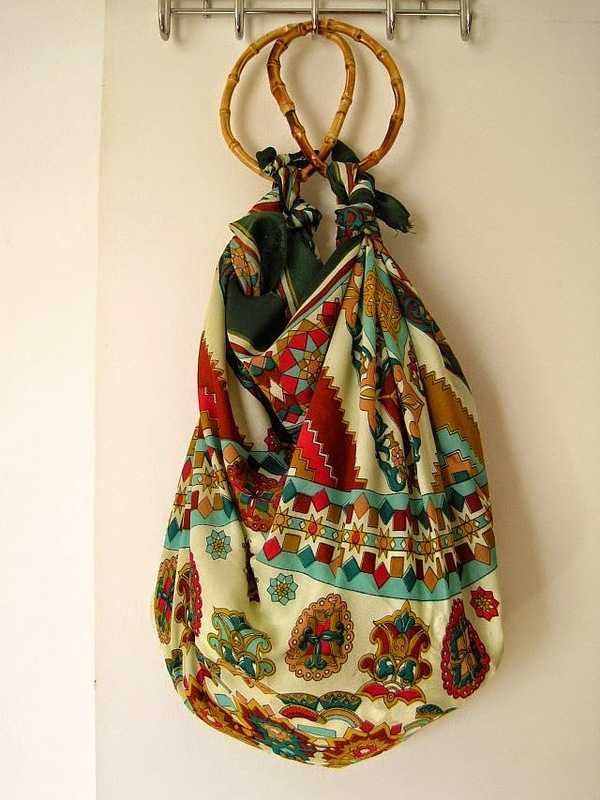 You can also use a pretty piece of fabric to make this bag. Two hoops. Or squares or any other shape for that matter. Spread your scarf out on a table. Tie a single knot at each corner making sure you have about 10 to 15 centimetres of scarf to tie more knots. Now half tie tie two corners together. Add your hoop to the knot. Complete the knot over the hoop. Make a few more knots to secure. Scroll back up to the beginning of this blog and find the Galleries where there are 100’s of older posts. There is a diverse mix of FREE sewing patterns and tutorials to wire and bead jewellery. The focus of this blog is to DIY before being tempted to buy.